The Home ProjectCalc will help you design, apply, install and finish your home improvement projects with precision and confidence. Get exactly what you need for your projects with instant calculations for Paint, Wallpaper, Tile, Carpet and Concrete. Save time and money on material requirements. This do-it-yourself project calculator help you to reduce calculation errors and make fewer trips to the home improvement store. Home ProjectCalc calculator is special designed for Do-It-Yourselfers, Woodworkers, Hobbyists, and Decorators. Works Directly In Yards, Feet, Inches, Fractions and Metric, Solves Converts Between All Standard Dimensional Math Formats, Works As A Standard Master. Tackle home improvement projects with confidence using this Home ProjectCalc Do-It-Yourself Project Calculator from Calculated Industries. 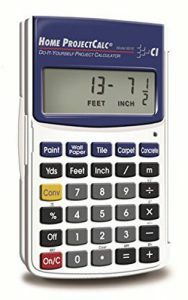 Made specifically for do-it-yourselfers, woodworkers, decorators, and home-improvement hobbyists, this calculator contains dedicated functions that allow you to determine material needs and costs and quickly convert between feet, inches, fractions, decimals, yards, and meters for accurate measurements. Included is a hinged, hard, protective door that swings open fully. The Home ProjectCalc calculator is designed to help you plan and execute your home improvement projects with confidence and precision. Built-in functions allow you to calculate costs for paint, wallpaper, concrete, and tile and determine the exact amounts you need for the project. As a result, you can reduce errors and make fewer trips to the hardware store. In addition, do-it-yourself project calculator lets you type measurements in feet, inches, fractions, decimals, yards, or meters including square and cubic formats and make quick measurement conversions. It can also function as a standard math calculator. e.g., How many square feet will five gallons of paint cover? This was a Christmas gift to my husband. He wanted a simple calculator to help add fractions and not in decimal points. This did the trick. I was happy that it would take 3/8" added to 5/16" and give the right answer 11/16". I'm an estimator by trade and these kind of calculations are easy. People who don't do these calcs on a regular basis can get stumped. Even I do. The button size was also a plus. My husband has large digits and the display is easily read. The long and short it's a great calculator for the DIYfer. A clever product allowing calculations with fractions....handy in wood working......reasonably price and a decent product. Rapidly shipped and very usable. As an Engineer & Computer Pro, I just learned to use an 8513 ProjectCalc bought a decade ago. WOW ... You guys done a hell of a great job solving a miserable task. (I tried to program something like this years ago -- I know the issues). a co-worker turned me on to this amazing do-it-yourself project calculator. as a contractor I have begun to use this product a lot and what a time-saver!!! It's so simply to use too! at the listed price you could afford to have one in your toolbelt and one in your truck or toolbox. I am not a fraction and math guru, but this diy project calculator saved my jobs. I have worked as a picture framer, artist, seamstress, knitter, and do home woodworking and gardening projects, all of which I measure out in the Imperial system. Though I do know most decimal conversions (like 0.625 in is 5/8 in), it is SO much easier to work in straight fractions instead of measuring in fractions, converting to decimals, executing calculations, converting back to fractions and going back to the mesurment. It is far more efficient to just plug in the fraction as I calculate. I have not yet had need to use the buttons for gallons of paint, bags of concrete, etc, but I am sure they will come in handy in some future home DIY project. For now, the calculator has become an indespensible tool in my studio. I wish I had learned about these sooner.